Twenty years from now, bulletproof vests could be three times stronger. The Hubble Telescope could scour space for dangerous debris. We could have devices that scan our body for tiny ticks, bionic eyes that help blind people see, and medical procedures that help paralysed people walk again. At least, that’s what these K-12 students came up with when Exploravision, the world’s largest science competition for thar age range, challenged them to envision the technology of the future. Exploravision is a Toshiba-sponsored project carried out by the National Science Teachers Association (NSTA). And, as Bill Nye told Business Insider, it’s part of the big picture when it comes to igniting scientific innovation in our country. The kids competing in Exploravision don’t just pull ideas out of a hat, slap them on a posterboard and call it a day. A teacher coaches the students as they simulate real research and development of their ideas. They pick a current technology, research it, envision what it might look like in 20 years, and describe the development steps, pros & cons, and obstacles, Exploravision explains on its website. There are four first place finalist teams nationally. Each team member receives a savings bond worth $10,000. Second-place winners receive a savings bond worth $5,000. And all the participants get to experience, hands-on, the rigorous and exciting scientific process. And, Nye said, this is important, because science education will play a vital role in our economic future. Nye said that these days, coming up with new ideas in science is more important than ever. “We don’t manufacture things the way we did in my father’s or grandfather’s time,” Nye said. 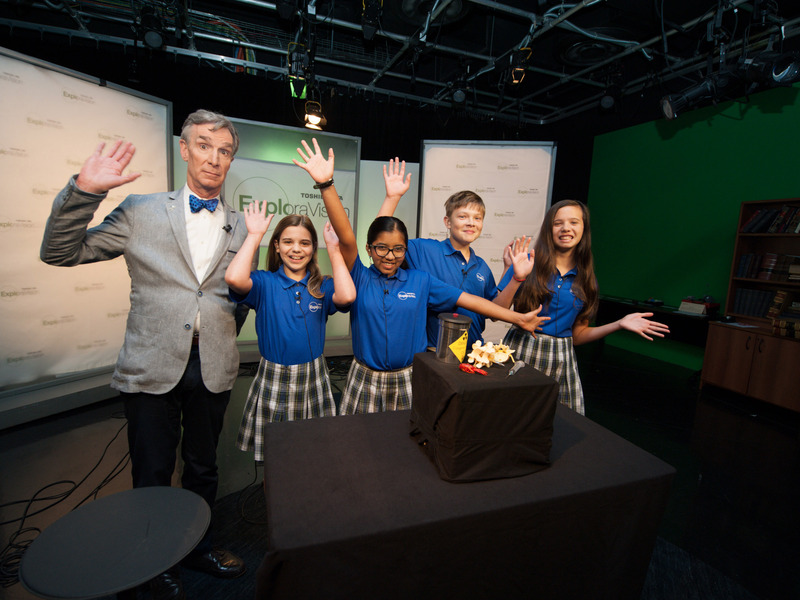 Competitions like Exploravision will get kids excited about science and ready to tackle issues in space, the environment, and medicine. “As we say in the National Science Teacher’s Association, we want science every day in every grade,” Nye said.